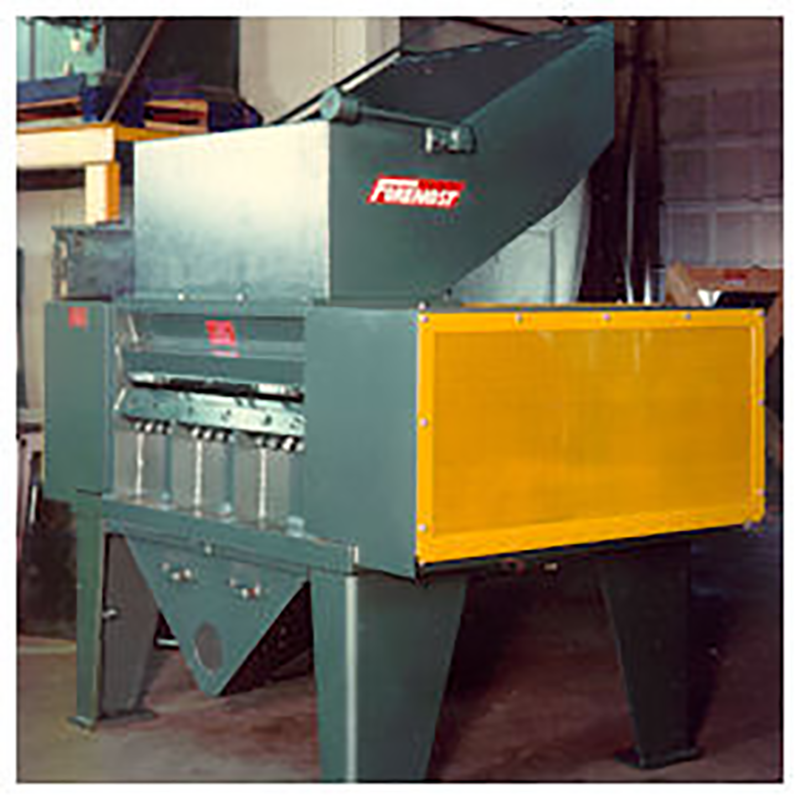 High Volume Granulators S-30B, S-45, S-60 – Foremost Machine Builders, Inc. This line of high capacity, heavy duty granulators can accommodate heavy extruded or cast sheet, or thermoforming scrap. Additionally, they are well suited for batch granulator of scrap parts, sprues and runners, and, due to the relatively small cutting circle and special knife design, can accommodate moderate size purgings and lumps. Throughputs well over 1,000 lbs. per hour are achieved with most materials. The cutting chamber, a heavy one-piece weldment, has all internal surfaces ground smooth for easiest cleaning during color or material changovers. The assembly is mounted on I-beams on the smaller size, and on the large sizes, a 3″ thick steel bed plate; which results in maximum rigidity, even under stress, for the frame and drive mechanism.. The rotor is solid steel with three rows of knives. These knives are specially ground on a shear angle for point contact cutting. A multiplicity of 15″ long knives is used, rather than one long knife. This arrangement permits the removal of one knife from each row for stagger-cutting action sometimes used on thinner materials. Shipping Weight: 7,500 lbs. 11,000 lbs. 16,000 lbs.